Indiana is home to many types of aquatic ecosystems, including lakes, rivers, streams, wetlands, and temporary (ephemeral) pools, which provide habitats for a wide range of plants and animals. These ecosystems will experience changes in water quantity, water temperature, ice cover, water clarity, and oxygen content as the state’s temperature and rainfall patterns shift. The plants and animals living in these aquatic ecosystems will undergo changes that will vary based on the species and the specific places they inhabit. It is challenging to know precisely how organisms will respond to changes in climate. Effects on one species create a difficult-to-predict chain reaction that potentially influences other species in the same ecosystem. Some organisms will adapt and evolve to survive, or even thrive, as the climate changes, but they will have to adjust to more than just the changes in climate. They will also respond to changes in a wide variety of other environmental factors that affect them, including invasive species, habitat destruction, contaminants, nutrient runoff, and land management decisions. While these complicated interactions make it challenging to predict the long-term fate of Indiana’s aquatic species, enough is known about climate-related stressors to help managers develop strategies to avoid the most critical outcomes, hopefully avoiding species loss. This report from the Indiana Climate Change Impacts Assessment (IN CCIA) uses climate projections for the state to explore the potential threats to Indiana’s aquatic ecosystems and describes potential management implications and opportunities. The findings presented here are primarily based on the IN CCIA Aquatic Ecosystems Working Group technical report (Höök et al., in review) and the IN CCIA report Indiana's Past and Future Climate (Widhalm et al., 2018). As air temperatures warm 5°F to 6°F by mid-century, water temperatures in Indiana’s streams, rivers and lakes will increase, the duration and extent of ice cover will decline, and lake stratification during the warm season will last longer. Shifting thermal characteristics in Indiana’s water bodies will have rippling effects on aquatic organisms, including their growth, survival, and reproduction patterns. 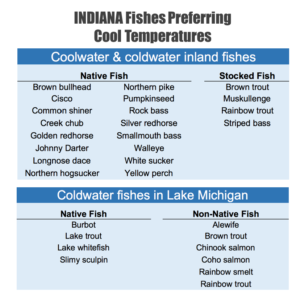 Warming water temperatures will generally maintain or increase habitat range for Indiana’s warmwater fishes, while significantly reducing habitat for Indiana’s coolwater and coldwater fishes. Changes in the timing, intensity and amount of Indiana’s precipitation, along with warmer air temperature and increased evaporation, will alter local hydrology, including wetland flooding and drying patterns. In response, plant species in and around wetlands will shift, leading to changes in breeding patterns for amphibians and invertebrates, and influencing the dispersal of both native and invasive species. Indiana’s streamflows are expected to become more variable, with seasonal changes in the amount and timing of flows. Altered streamflow patterns threaten habitat, breeding, and survival of sensitive species such as Indiana’s endangered freshwater mussels. 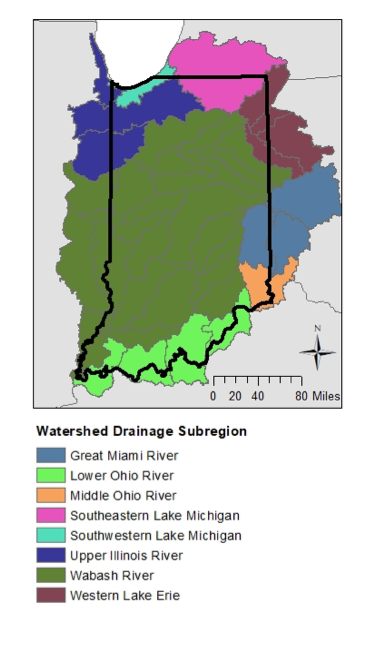 More frequent and intense precipitation, especially in the spring, will increase the risk of human-derived nutrients entering Indiana waterways as subsurface tile drainflow and total runoff increases. Warming waters, combined with elevated nutrient levels, will lead to more algal blooms, reduced water clarity, and depleted oxygen levels. Lake stratification—where warm surface water and cold bottom water are unable to mix—is expected to begin earlier in the year and last longer in Indiana lakes and reservoirs in response to warming air temperatures and reduced ice cover. In stratified lakes, increased risk of large algal blooms will increase the occurrence, extent, and intensity of bottom-water hypoxia (low oxygen levels), which will reduce habitat for coldwater fishes like cisco and rainbow trout. Near-surface summer water temperatures throughout Lake Michigan have warmed by over 3°F since 1980, and this warming trend is projected to continue in the coming decades. However, the impact of warming temperatures on aquatic habitats in southern Lake Michigan is uncertain. Future conditions for Indiana’s shallow and highly variable near-shore water will depend on future water levels, wind patterns, and lake-wide warming. Indiana’s changing climate will lead to shifts in the types and number of aquatic and semiaquatic species throughout the state. As air and water temperatures warm, invasive animals and plants, along with new parasites, may expand their ranges into Indiana. Increased precipitation and flooding raises the risk of invasive freshwater species spreading to new habitats. It is difficult to confidently predict how species will respond and adapt to continued changes in climate, land use, and human management. Managing for ecosystem diversity and implementing precautionary management approaches may help protect Indiana’s aquatic ecosystems from a rapidly changing environment. Above: An illustration of a few of the key ways in which climate change will affect Indiana’s aquatic ecosystems. Indiana’s aquatic ecosystems are made up of standing and flowing water systems, as well as wetlands and riparian areas—the woods and wetlands along the banks of rivers and streams. About 2.3 percent of the state—roughly 575,000 acres—is covered by rivers, streams, lakes, and ponds. Wetlands cover about 3.5 percent of the state, or about 815,000 acres. The southernmost portion of Lake Michigan. A diversity of rivers and creeks, including the Kankakee River, Tippecanoe River, Wabash River, Ohio River, and White River. Many small ponds, seasonal ephemeral pools, and wetlands. These ecosystems are home to a variety of wildlife: plants, fish, mammals, birds, reptiles, amphibians and freshwater mussels. Common species in Indiana’s rivers, lakes and wetlands include catfish, bass, perch, trout, sturgeon, turtles, salamanders, wood ducks, gulls, river otters, and many more. Indiana’s water is key to the economy, benefiting agriculture, transportation, many industries, recreation, and more. Freshwater recreation contributes more than $1 billion annually1 to the state’s economy. Waterborne shipping is responsible for more than 155,000 direct and indirect jobs in Indiana and creates $21.5 billion in economic activity, including nearly $1 billion in state and local taxes2. 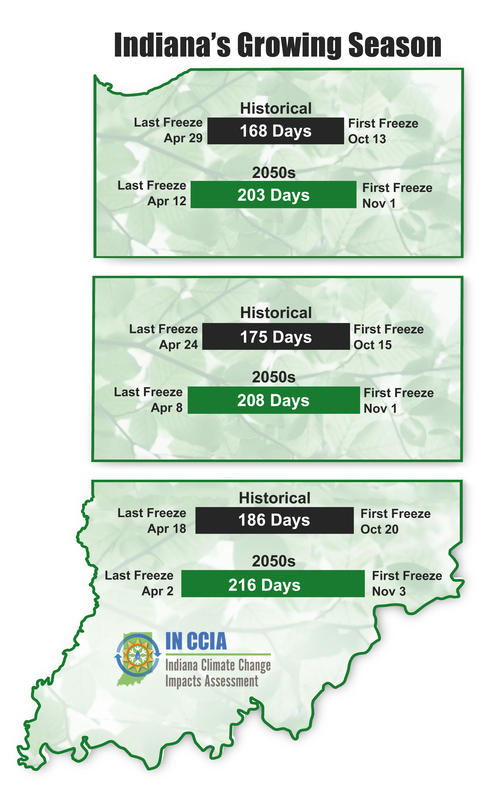 Over the last century, Indiana has warmed by 1.2°F, the frost-free season has lengthened by about 9 days, and annual rainfall has increased by more than 5.5 inches. Since the 1920s, the magnitude of flooding in Indiana has been increasing by 6 to 9 percent per decade (USGCRP, 2017). Regional observations across the Midwest show a 42 percent increase in the amount of rain falling in heavy downpours3 and a 53 percent increase in the number of heavy rain events (USGCRP 2017). Additionally, over the last century the severity of drought has declined (Mishra et al. 2010). 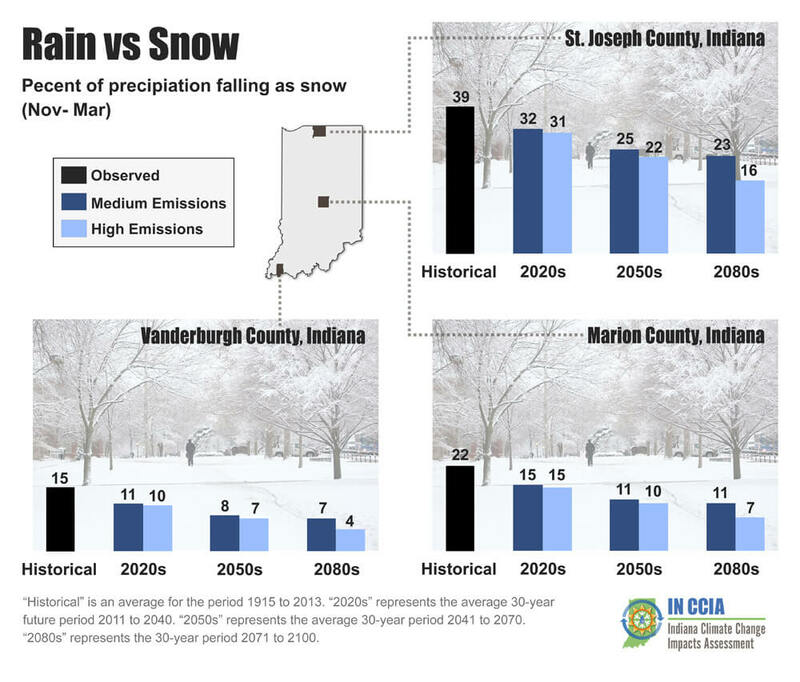 Learn more about Indiana’s Climate Trends. Indiana scientists project that annual statewide temperatures will increase by 5 to 6°F by mid-century and 6 to 10°F by late century, depending on the amount of heat-trapping gases released into the atmosphere by human activities4. Warming is expected in all seasons, and the state’s growing season—in which temperatures continuously stay above 32°F—is projected to increase by about a month by mid-century5. Indiana is projected to have fewer extreme cold events and significantly more extreme heat events. Statewide annual precipitation is projected to increase by 6 to 8 percent by mid-century and 5 to 10 percent by late-century, depending on the amount of heat-trapping gases released into the atmosphere by human activities6. Seasonal changes in precipitation show distinct and important differences. Winter and spring will become wetter by mid-century, with projected precipitation increases of 16 to 20 percent and 13 to 16 percent, respectively7. During the cold season, more precipitation will fall as rain instead of snow. Projections for summer and fall are less certain, but these seasons are likely to become drier by mid-century, with about a 2 to 3 percent decline in rainfall8. Precipitation extremes in Indiana are expected to become more variable in the future too. Indiana’s risk of long-duration drought (lasting months to years) is projected to decline, but short-duration droughts (lasting weeks to months) are expected to become more frequent and affect larger areas of the state9 (Mishra et al. 2010). Conversely, increasing rainfall and heavy downpours will likely increase the risk of future flooding in Indiana, especially during the winter and spring seasons. 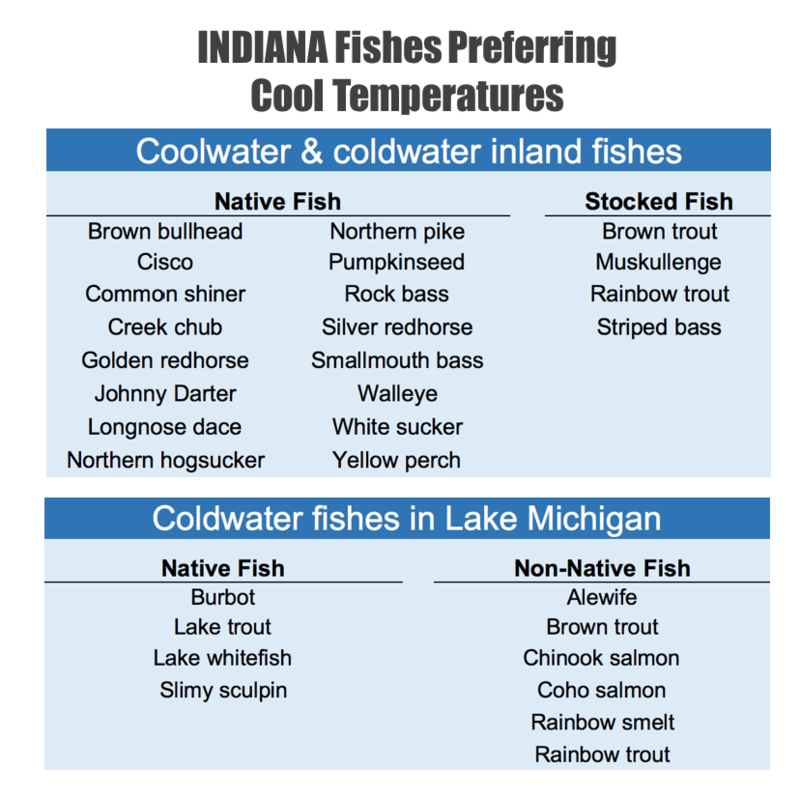 Above: Examples of coolwater and coldwater fish found in Indiana’s inland lakes, rivers, and the Indiana waters of Lake Michigan. Research suggests that climate change will reduce habitat suitability for these fish (Mohseni et al. 2003). Water temperature is crucial to many aquatic organisms. Many species cannot regulate their own body temperatures, making water temperature critical to their survival. Water temperature directly affects aquatic organisms’ metabolic activity, feeding, and growth, and water temperature often signals to organisms that it is time to migrate or reproduce. A warming atmosphere will lead to increased average water temperatures, but the specific amount of warming will depend on location-specific conditions such as the size, depth, and drainage characteristics of the water body. Given that many of Indiana’s water bodies are relatively shallow, water temperatures in Indiana’s rivers and streams tend to roughly mirror fluctuations in air temperatures. Water temperatures in deeper bodies, such as lakes and reservoirs, are more complex. Patterns of lake stratification—where a lake separates into distinct vertical layers based on temperature-related density differences—depend on air temperature, ice cover, water clarity, and wind and storms. The timing and depth of lake stratification influence habitat suitability for fish and other aquatic species as well as various ecosystem processes. Warming air temperatures, including earlier warming in spring and later cooling in fall, will decrease the extent, thickness, and duration of ice cover on Indiana’s lakes, generally leading to less ice overall, for fewer weeks of the year. During the growing season, similar processes will lead to more severe thermal stratification, with stratification developing earlier in the spring and breaking down later in the fall. Warmer water temperatures will have many direct and indirect consequences for Indiana’s aquatic ecosystems. As water temperatures warm and thermal characteristics (such as timing and intensity of lake stratification) shift, some water bodies may become unsuitable for certain species of plants, fish, and other animals. Warming water is likely to increase or keep steady the habitat range for warmwater fish species, while fishes classified as coolwater or coldwater species in Indiana’s inland water bodies are likely to see substantial reductions in suitable habitat (Mohseni et al. 2003). 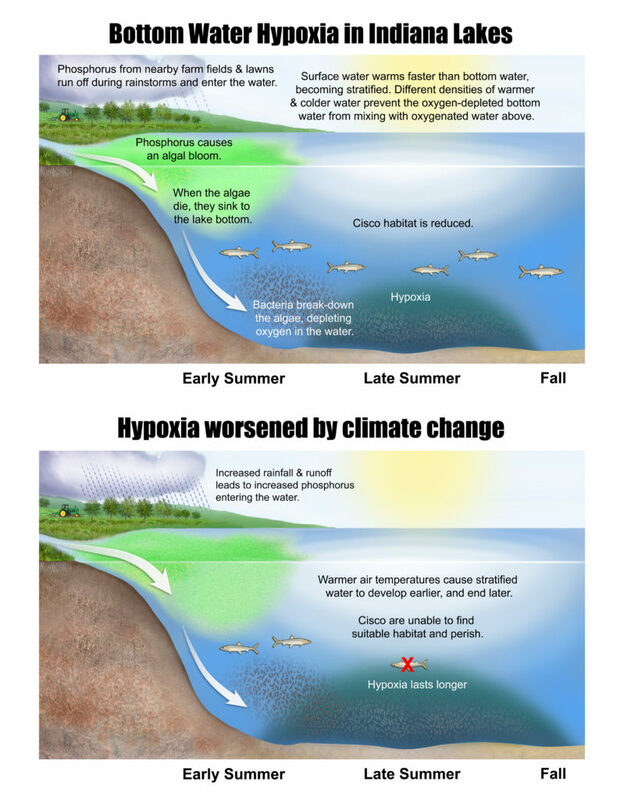 In stratified water—where warm surface water and cold bottom water are unable to mix— some fish may be able to move down the water column to find cooler water, but that can expose them to other dangers, including insufficient oxygen (view hypoxia figure). Seasonal shifts in Indiana’s hydrology will have profound impacts on aquatic ecosystems. Water availability (amount and timing) and subsequent stream flows dictate habitat suitability, species abundance, and the timing of biological events such as migration and reproduction. Observations show that annual, spring, summer, and winter average streamflows are increasing at the majority of locations across Indiana, while average fall streamflows are generally decreasing10. Future projections indicate that streamflows are expected to increase from January through May in Indiana and decrease in the summer and fall10. Both the timing and amount of peak streamflows are expected to change in Indiana. Peak flow is projected to be less intense in the north and more intense in the south through mid-century and late century (Cherkauer et al., in prep). Peak flow is generally expected to occur later in the year in the southern half of the state and earlier in the north (Cherkauer et al., in prep). 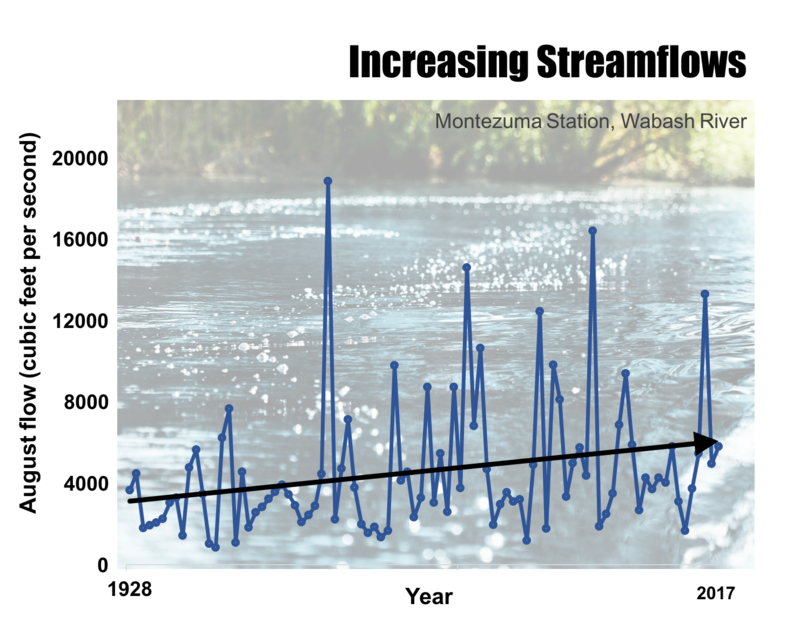 Above: Average August streamflow at the USGS Montezuma measuring station along the Wabash River in west central Indiana from 1928 to 2017. The black line shows the upward trend in streamflow. (Source: Höök et al., in review). Less summer rain and higher temperatures are likely to result in drier conditions for Indiana’s wetlands, lakes, streams, and rivers. Water availability is critical for maintaining suitable habitats for various species of plants and animals. Wetlands, floodplains, ephemeral pools, and headwater streams—all important freshwater ecosystems—are vulnerable to prolonged dry conditions. With reduced water, plants more suited to dry land can begin to grow, potentially crowding out wetland species. As the dry-land plants become established, soil characteristics, such as water-holding capacity, can change, which means less precipitation can be held during rainfall events. This creates a feedback loop where as more dry-land plants establish, less water is retained and fewer wetland plants are able to survive, which intensifies the transition from a wetland to a terrestrial, or dry-land, system. Many animals, including certain amphibians, are adapted to live in ponds and streams that may have water for short periods of time (ephemeral pools). If those places are dry more often or lose their water sooner than usual, some animals may not survive or may have to move to more suitable habitats. Drying can lead to loss of habitat connectivity that may impact some insects, amphibians, fish, and plants. Certain fish might not be able to move to preferred breeding grounds as habitats become more fragmented due to loss of water. Because they can fly long distances, waterfowl can expand their ranges more easily than most other aquatic species. However, certain waterfowl species might not find Indiana suitable for breeding or habitats, so those birds may move to other areas. According to the National Audubon Society (2013), waterfowl species including the horned grebe, ring-necked duck, hooded merganser and bufflehead are expected to lose a large portion of either their summer or winter range in Indiana due to shifting climate patterns. Increased precipitation and streamflows will also impact plants and wildlife. Past flooding events on the Wabash River have seemingly changed the assemblages of fish observed in certain places. Future flooding events may further alter habitats. Increased erosion and hard rain can lead to murkier water, keeping light from reaching submerged aquatic plants that serve as important habitats, refuges, and food for fish and other animals. Riparian areas, the woods and wetlands along the banks of rivers and streams, are sensitive to environmental change and vulnerable to changing climate conditions. Riparian areas can be more heavily eroded during intense or increased rains. Not only is this damaging to plants and animals that use those areas as habitat, but sediments that run off during the erosion event can further affect the downstream ecosystems where they are deposited. Many of Indiana’s ephemeral pools—temporary ponds of water that serve as critical habitat for certain amphibians and other species—are expected to disappear (become permanent ponds) as temperatures warm and precipitation becomes more abundant and intense. Four-toed Salamanders, a species of special concern in Indiana, rely on ephemeral pools and could suffer dramatically from such climate shifts. This would decrease overall species diversity. When the timing of biological events is matched to environmental conditions, shifts in the environment can have a direct impact on species survival, and indirect effects may echo throughout the ecosystem. For example, changes in the timing of high and low flows in rivers and streams can disrupt cues that fish use for spawning, egg hatching, and migration. Many species have adapted the timing of their emergence, breeding, and migration to align with seasonal temperature and rainfall patterns. As climate patterns shift, so, too, does the timing of these biological events. For instance, amphibians in New York have shifted the timing of their calling and breeding by three weeks over the last century due to warming temperatures (Gibbs and Breisch 2001). Ephemeral pools, which depend on spring rainfall for filling, are important breeding grounds for several of Indiana’s aquatic species, including wood frogs, marbled salamanders, and spotted salamanders. Earlier warming in spring could trigger species to emerge before these shallow ponds have filled, which could increase mortality rates as species wait for suitable breeding habitat. Species that breed early in the year are expected to be disproportionally affected by the mismatched timing of climate and biological events. Around 80 species of freshwater mussels are native to Indiana, but more than half have disappeared from the state, or are considered endangered or of special concern. As filter-feeders, mussels help improve water quality by removing microorganisms and nutrients from Indiana waterways. However, this also leaves them highly susceptible to pollution. Streams that have thriving mussel populations likely have good water quality. Overharvesting, pollution, loss of habitat, and invasive species are all culprits in the decline of mussels. The remaining mussels are especially vulnerable to the effects of climate change. Drought: Mussels can do little to move themselves to better habitat as water levels decrease during hotter, drier summers. Stranded on dry ground, they are likely to die. Flooding: Mussels living in streams or rivers tend to cluster in stable beds. But as changes in frequency and intensity of precipitation occur, faster-flowing streams may destroy these beds and push mussels to unsuitable habitats. Species Interactions: Mussel reproduction is dependent on fish that act as hosts for mussel larvae, with some mussels needing specific fish species. As water temperatures and streamflow patterns change, host fish may no longer come in contact with mussels at the right time, disrupting interactions necessary for mussel reproduction. Competing Water Interests: Indiana waterways are managed for various purposes—recreation, drinking water supply, agriculture, environmental protection—and during times of water stress, conflict can arise. While mussel habitat is currently protected for Indiana’s most endangered species, shifting priorities and regulations could further stress these fragile animals. Over the last 150 years, much of Indiana’s historic wetland and forest has been converted to agricultural land dominated by soybeans and corn. The fertilizers used to grow these crops often wind up in nearby water, either through surface runoff, agricultural tile drains (buried drainage pipes that lower the water table), or leaching into groundwater. Rising temperatures will expand the growing season, allowing farmers with suitable field conditions (i.e. not too wet) to plant and fertilize earlier in the spring11. 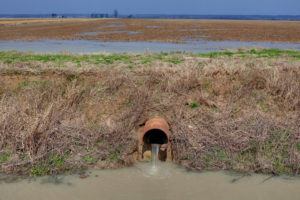 Less snow cover in the late winter and early spring, coupled with increasing precipitation during those seasons, is expected to increase agricultural runoff and drainage from farm fields. 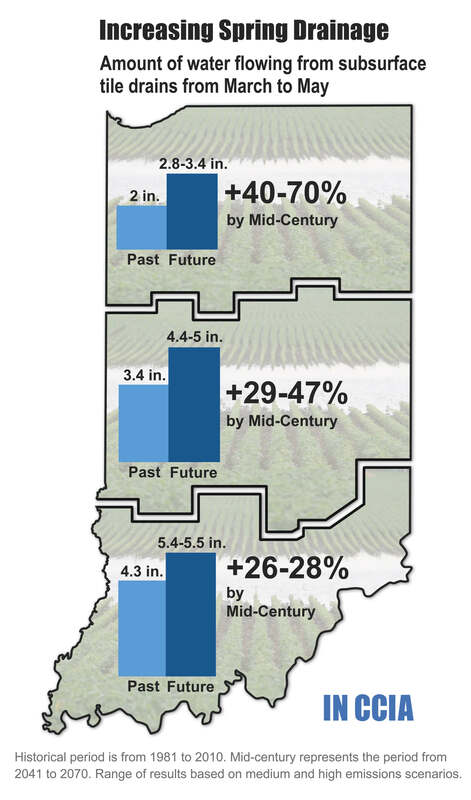 Annual subsurface tile drainage in Indiana is projected to increase by 17 to 25 percent by mid-century12, with the greatest increase focused in the spring (March to May). 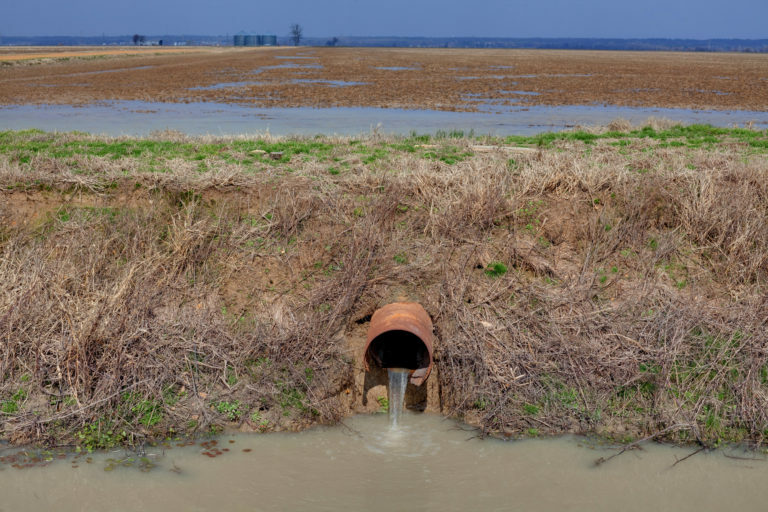 Increased runoff and drainage will carry more nitrogen and phosphorus from farm fields and deposit them into nearby streams and bodies of water. An increased flow of nutrients into water would speed up growth of bacteria and algae. Fast-growing algae can harm upper and lower levels of the food web, and fast-growing cyanobacteria can produce toxins harmful to animals and humans. In addition, waters can become depleted of oxygen below areas of rapid algal growth, as the organisms decomposing the dead algae use up available oxygen in the water. This makes these habitats, at least temporarily, uninhabitable for many species. Phosphorus is the nutrient primarily responsible for negative impacts on Indiana’s freshwater systems, so increased runoff of this specific nutrient is expected to have the greatest impact on local aquatic ecosystems. The majority of Indiana’s waterways drain to the Mississippi River and then on to the Gulf of Mexico. A few waterways drain to Lake Erie and Lake Michigan. Increased levels of both nitrogen and phosphorus would intensify already sizeable hypoxic zones (areas with very low oxygen levels) in the Gulf of Mexico and Lake Erie. Cisco, a coldwater fish native to northern Indiana’s glacial lakes, can only tolerate a narrow range of relatively cool temperatures and needs oxygen-rich water. While cisco inhabit many locations across the Great Lakes region, Indiana is the southernmost extent of its habitat range. Cisco was present in around 50 northern Indiana lakes at the beginning of the 20th Century, but today is found in only six13. In stratified lakes—where warm surface water and cold bottom water are unable to mix—cisco normally move to cooler bottom waters during the summer. However, in many Indiana lakes, bottom waters become hypoxic (oxygen-depleted) as bacteria decompose algal blooms that develop in response to human-related nutrient runoff (specifically phosphorous). With warm surface temperatures and limited oxygen in bottom waters, cisco are squeezed between a rock and hard place, and may only be able to occupy a very narrow layer in the middle of the water column. If this suitable layer becomes too narrow, cisco can experience massive die-offs and can disappear entirely from a lake. Studies suggest this phenomenon has contributed to the loss of cisco from many of the Indiana lakes they previously occupied. With warming temperatures contributing to a longer stratified period and increasing precipitation leading to more phosphorus entering waterways and more intense algal blooms, hypoxic conditions in the bottom waters of Indiana’s lakes are expected to become worse in the future. Cisco and other coldwater fishes are likely to find themselves without livable conditions and such species may be lost from Indiana’s lakes over this century. Observations show that near-surface summer water temperatures in Lake Michigan have been warming about 1°F per decade14 (Collingsworth et al. 2017). By mid-century, summer water temperatures are projected to increase about 5°F to 6°F above the historical average15 (Kao et al. 2015). Because Lake Michigan is so deep and cold, most fish species currently have limited thermal habitat available to them. As waters warm in a changing climate, habitat suitability may increase for warmwater and coolwater fish species such as smallmouth bass, yellow perch, and walleye, as well as for coldwater species such as lake trout, Chinook salmon, rainbow trout, and lake whitefish. As near-shore areas and near-surface waters warm, some species may need to move further offshore or to deeper waters during warm seasons. As metabolic rates increase with temperature, fish that end up occupying warmer water require an increased food supply. Thus, these fish will need to seek out habitat with adequate light and available prey to maintain their growth and performance. As Lake Michigan warms, fish spawning periods may also shift. Reproductive success for Lake Michigan fishes, such as yellow perch and lake whitefish, is expected to change in response to warming temperatures and resulting shifts in stratification and ice cover. Since most fish produce a huge number of offspring, shifts in reproduction success and early life survival could have strong effects on resulting adult population sizes. Similar to smaller water bodies in Indiana, Lake Michigan is expected to receive greater amounts of phosphorous as rainfall and runoff increase. However, unlike Indiana’s inland lakes, it is uncertain whether these added nutrients will lead to algal blooms and subsequent water-quality issues. Long-term nutrient-control programs and the filtering activities of invasive mussels help buffer southern Lake Michigan against algal blooms, and this may or may not continue into the future. While the above information describes Lake Michigan as a whole, it is important to point out that Indiana waters are likely to have a somewhat unique local response to changing climate conditions. Indiana waters are shallow and tend to be warmer than offshore waters during non-winter seasons. Water temperatures, water levels, water clarity, and water currents are highly variable and strongly influenced by prevailing wind patterns. Currently, it is unclear how prevailing wind directions in and around the Indiana waters of Lake Michigan may shift in the future. Invasive animals and plants that cannot tolerate cold may expand their ranges as air and water temperatures in Indiana warm. Increased flooding could allow others to spread from their current habitats, as happened with several species of Asian carp that are moving north and threatening to reach lakes Michigan and Erie. In the Great Lakes, invasive fish and invertebrates including round goby, sea lamprey, and invasive water fleas may spread with warmer temperatures. 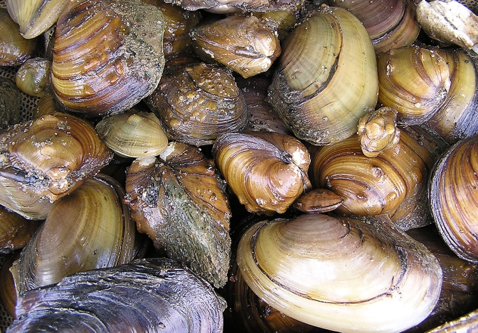 Changing temperature and precipitation patterns could lead to the spread of the invasive freshwater clam, Corbicula fluminea, that is known to damage water and water intake pipes. Drought conditions may dry riparian areas, the wetland areas along the banks of rivers, and coastal areas, allowing invasive plant species to move in and thrive. Parasites are another concern. Not only can new parasites move into an area with their hosts, but warmer temperatures and longer growing seasons allow both invasive and native parasites to increase their population numbers. With higher numbers of parasites overall, there is a higher likelihood of parasite movement among animals, including transmission to humans. At the same time, the parasites themselves may also be harmed by extreme temperatures and drought. 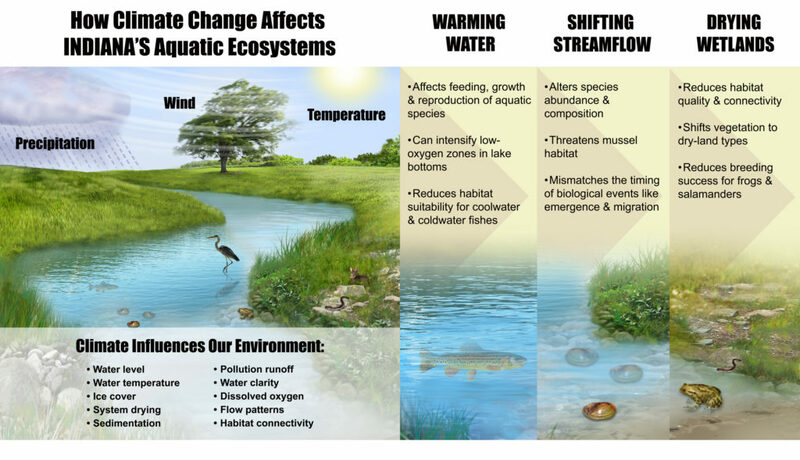 Given the complicated interplay between different stressors acting on Indiana’s aquatic ecosystems, there are few concrete, well-accepted predictions about how climate change will affect individual aquatic ecosystems and the plant and animal species that inhabit them. Still, there are some sound management practices that can be employed to protect against negative impacts from rising temperatures and changes to precipitation and runoff patterns. First, a greater focus on climate change impacts may be necessary to improve long-term management of Indiana’s aquatic ecosystems. A recent survey of Great Lakes fisheries managers suggested that there is currently far more consideration of short-term threats, like invasive species and habitat degradation (Mulvaney et al. 2014). A greater focus on managing for climate change may include expanding research efforts to improve understanding of how climate change will affect Indiana’s aquatic ecosystems and more explicit consideration and incorporation of climate change effects in specific management decisions. Second, diverse ecosystems are better equipped to deal with the stressors imparted by a changing climate, so management decisions should aim to maintain or enhance diversity in communities, populations, and individuals. Having several species that perform a critical ecosystem service in one place—like more than one plant creating a structural habitat where small animals can take refuge, or more than one fish species serving as prey for a larger fish or bird—increases the likelihood that at least one species will survive if others are more vulnerable to shifting environmental conditions. Diversifying types of habitats, including those not necessarily perceived as the most suitable habitats for species today, may help preserve species under changing conditions. Also, increasing habitat connectivity, for example increasing green space in urban areas, can allow species to move into areas where they may be able to perform better. Increasing genetic diversity within a population increases the likelihood that traits which enable adaptation to climate or other environmental change will be present. When stocking fish, for example, it may be helpful to consider genetic diversity. Fish from southern populations, which may have already genetically adapted to warming conditions, may be considered to stock regions further north to ensure northern population persistence as temperatures continue to rise. Third, adoption of a precautionary principle, erring on the side of conserving systems that are sensitive or at risk, would be wise. While some systems and species seem to be at greater risk to climate change than others, precisely pinpointing how specific ecosystems, communities, and populations may respond is inappropriate. However, assuming there will be no change to these systems may be even more inappropriate and risky. In addition to climate, many other factors and processes determine whether a species will thrive or struggle in a given location. Different species are affected by each other and by non-climate stressors, and these interactions influence how individual populations respond to altered thermal conditions, hydrology, and nutrient loading. The complexity of these interactions makes predictions difficult. At the same time, the species themselves may evolve in response to physical and chemical changes in their aquatic habitats, but it is uncertain whether and how quickly this evolution will occur. To reduce this uncertainty and improve our predictive ability, scientists must learn more about complex biological interactions and stress responses in these systems. Additionally, each water body is unique, with different species interactions, different human influences, and even different climate drivers. For this reason, predictions of ecosystem responses to climate change could be vastly improved by location-specific observations and computer simulations. There are also uncertainties about the responsiveness of species and entire ecosystems to human-driven management approaches. For instance, it is possible to pump oxygen into hypoxic lake bottoms, but it is unclear how much oxygen would be needed to cause a positive environmental response and if such pumping is economically practical. Can variable streamflows and warmer water temperatures be offset by changing how dams are managed, and how would such changes affect upstream and downstream species? Few scientists have examined the potential for, and limitations to, proactive adaptation strategies, making it difficult to anticipate how much or how little these actions could offset the negative effects of our changing climate. The ongoing warming of Indiana’s climate will accelerate over the coming century. At the same time, precipitation is expected to continue to increase during the winter and spring months, but could potentially decrease during summer and fall. These changes will affect aquatic ecosystems throughout the state. Hot, dry conditions may decrease suitable habitat for species that rely on ephemeral pools or small bodies of water. Flooding may disrupt habitat of certain species, such as freshwater mussels, and lead to murkier water, which can suppress underwater plant growth. Increased rainfall will carry more phosphorus to waterways, fueling algal growth and depleting oxygen from the water. Many sources of uncertainty cloud predictions of how climate change will affect Indiana’s complex aquatic ecosystems and even individual species. It is clear that the changes will create winners and losers, with some species adapting or expanding their ranges, and others becoming suppressed by unfavorable environmental conditions or being lost from Indiana entirely. To maintain the species and the ecosystem services we have today, aquatic ecosystem managers can work to bolster species and genetic diversity, and should increase their focus on managing for long-term threats to Indiana’s aquatic ecosystems. Cherkauer, K.A., Bowling, L., Chaubey, I., Chin, N., Ficklin, D., Kines, S., Lee, C., Pignotti, G., Rahman, S., Singh, S., Valappil, F., and T. Williamson. (in preparation). Climate change impacts and strategies for adaptation for water resource management in Indiana. Forthcoming technical report from the Indiana Climate Change Impacts Assessment. Honsey, A., Donabauer, S., and T.O. Höök. (2016). An analysis of lake morphometric and land use characteristics that promote persistence of Cisco Coregonus artedi in Indiana. Transactions of the American Fisheries Society. 154: 363-373. USGCRP (2017) Climate Science Special Report: Fourth National Climate Assessment, Volume I [Wuebbles, D.J., D.W. Fahey, K.A. Hibbard, D.J. Dokken, B.C. Stewart, and T.K. Maycock (eds.)]. U.S. Global Change Research Program, Washington, DC, USA, 470 pp. We thank Brian Wallheimer for drafting this report, Stan Coffman for assistance with graphics, and staff from Purdue University’s Department of Agricultural Communication, including Maureen Manier, Erin Robinson, Kenny Wilson, Andrew Banta, Joan Crow and Russell Merzdorf for help with the production and release of the report. Thank you to PCCRC managing director Rose Filley for valuable input. We are grateful to Nina Collins and Marcia Wilhelm-South from the Purdue University Libraries Scholarly Publishing Division for online publication support for all documents associated with the IN CCIA. This is Illinois-Indiana Sea Grant Publication Number IISG18-RCE-RLA-006. 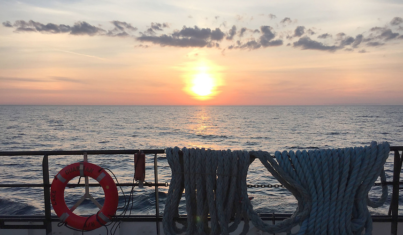 1Information from the report Water and Quality of Life in Indiana from The Conservation Law Center and INTERA, Inc.
2Information from the report The Economic Impacts of the Indiana Maritime Industry. 3Averaged across the Midwestern US, there has been a 42 percent increase in 2-day rainfall totals with a 5-year return interval from 1958 to 2016. 4Projected change in temperature averaged across 10 climate models for two scenarios of heat-trapping gas emissions based on analysis by Hamlet et al. (in review) and Widhalm et al. (2018). Mid-century refers to the 30-year period from 2041 to 2070. Late century refers to the 30-year period from 2071 to 2100. Future temperature changes are relative to the statewide annual average temperature from 1971 to 2000. Further details provided in Widhalm et al. (2018). 6Projected change in precipitation averaged across 10 climate models for two scenarios of heat-trapping gas emissions based on analysis by Hamlet et al. (in review) and Widhalm et al. (2018). Mid-century refers to the 30-year period from 2041 to 2070. Late century refers to the 30-year period from 2071 to 2100. Future precipitation changes are relative to the statewide annual precipitation from 1971 to 2000. Further details provided in Widhalm et al. (2018). 7Ten different climate models are used to look at Indiana’s future climate. There is high agreement across these models when looking at Indiana’s future precipitation during the winter and spring months as well as annually. Nearly all of the models show substantial increases in precipitation, which gives scientists high confidence in this prediction. For more information, see A Range of Possible Future Climates. 8Ten different climate models are used to look at Indiana’s future climate. There is low agreement across these models when looking at Indiana’s future precipitation during the summer and fall months. Some models show slight increases while others show decreases, which gives scientists lower confidence in this prediction. For more information, see A Range of Possible Future Climates. 9Long-duration droughts occur over time periods of months to years and often lead to impacts on hydrological conditions. Short-duration droughts occur over periods of weeks to seasons and often lead to impacts on agricultural production. 10Data provided by the IN CCIA Water Resources Working Group (Cherkauer et al. in preparation). They examined USGS flow monitoring data for 109 sites for the last 30 years. Percent of stations showing increasing streamflow: Annual (90 percent), spring (97 percent), summer (78 percent), winter (71percent). Percent of stations showing decreasing streamflow: Fall (72 percent). 11See IN CCIA reports on agricultural impacts (Bowling et al. 2018) and climate impacts (Widhalm et al. 2018) for additional information. 12Mid-century refers to the 30-year period from 2041 to 2070. Future changes are relative to the historical period 1981 to 2010. Range of future projections based on medium- and high-emissions scenarios. Additional details available in Bowling et al. 2018. 13Based on a statewide fish survey conducted by the Indiana Department of Natural Resources in 2012. See Honsey et al. (2016) for additional details. 14Summer represents the average period from July through September. The observed trend is for the period 1980 to 2015. 15Mid-century is the average future period from 2043 to 2070. The historical average is for the period 1964 to 1993.